This month in NGLG, I’m taking a look at a couple of 3D games that don’t require too much horsepower, but are still fun diversions. Lightcycle games should seem familiar to anyone who has played the ‘snake’ type games that are common on cell phones. The goal is to box in your opponents with your trail, all the while making sure you don’t slam into their trails (as well as your own!). Often, the games mimic the look and feel from the 1982 film Tron, and require quick reflexes and a mind for strategy. 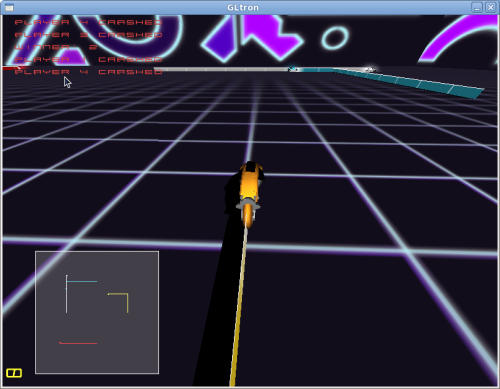 First up is GLtron, which has a good original soundtrack, highly detailed lightcycles, and very simple controls. The programmers have done a great job in making sure the game can be expanded with different artpacks, and the game is quite responsive and fluid. The head programmer, Andreas Umbach, gave an update on the game’s site a few months ago about his plans to picking the game back up, and it sounds like network play might be coming out shortly. That’s a good thing, because without network play the game doesn’t get quite the replay value that it should. There’s a split-screen multiplayer mode, but those with small screens will have a hard time with it. Looking for an online multiplayer version of Tron-clones, I came across Armagetron Advanced. This was originally a fork of Armagetron, as the lead, Manual Moos, had stopped updating the original. After the extension by several open source contributors, Manual returned, and the fork officially obsoleted the original Armagetron. If you’ve only played the original, you might want to give the Advanced version a try. 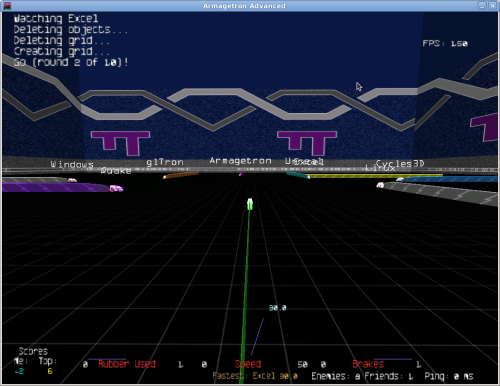 Armegetron Advanced not only has network multiplayer capability, but it also has other gameplay elements that add to the fun of the game, such as ‘death zones’ and lines that diminish over time. Getting on a server was a snap, and the lag was minimal (a necessity for this type of game). The folks behind the game have done a fantastic job putting up documentation on their site: not just on how to tweak the game for that extra little bit of speed, but also the various tactics and strategies you can use to master the game. GLtron’s website has the source and other helpful information about the game, and it’s likely that your distribution already has this packaged. The Armagetron Advanced website has server lists, a well-maintained wiki, and packages for the major distros. There are Mac OS X and Windows versions of these games, so you can play along with your friends who might not use Linux.